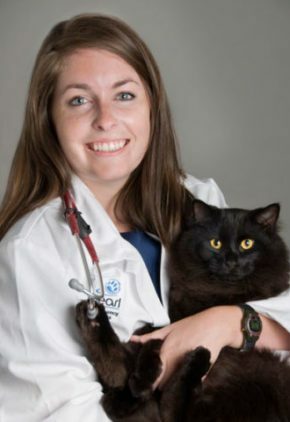 Dr. Samantha Aumann is a critical care resident and is particularly interested in feline medicine and surgery. Dr. Aumann likes to backpack, hike, kayak and watch movies with her husband. They have three cats: Zelda, Gypsy and Cricket. Dr. Christa Barrett is a small animal medicine and surgery intern. 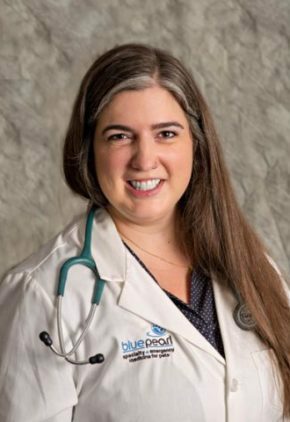 Given her interest in aquatic animals, it’s no surprise that Dr. Barrett loves just about anything on the water. She also enjoys hiking, rock climbing and traveling. She has three cats, orange tabby Jack, Onix who’s black, and calico Mae who acts like a dog. Dr. Eduardo Benjamin is particularly interested in cardiovascular pathophysiology and likes managing cases of congestive heart failure, cardiac arrhythmias, and cardiac tamponade, or fluid around the heart. Dr. Benjamin likes dinners out with his wife, shopping and visiting parks. He also enjoys watching basketball, football, and track and field; managing his fantasy football and basketball teams; and playing sports video games. The family pets include cat Ryu Alejandro, and lab/beagle mix Pogo Emanuel. 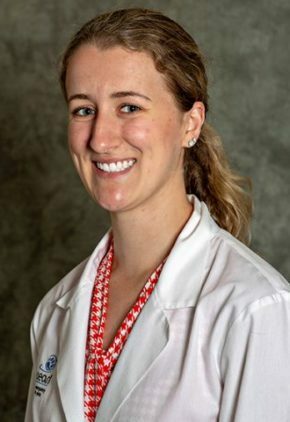 Dr. Sarah Binkerd is a small animal medicine and surgery intern. Dr. Binkerd’s favorite hobby is wildlife photography. She also likes to hike and explore the outdoors. Bailey is her pit bull. Dr. Tony Blanco is a small animal medicine and surgery intern. Dr. Blanco spends time outside kayaking, cycling and playing tennis. He also enjoys horror shows or movies, cooking, and listening to music. Leia is his miniature Australian Shepherd who befriends everyone and gets all the attention. 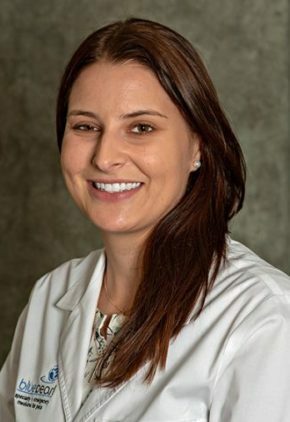 Dr. Helga Bleyaert has extensive experience and specialized training in minimally invasive surgical procedures such as arthroscopy and laparoscopy. She also has completed specialized training in total hip replacement, tibial tuberosity advancement procedure for anterior cruciate ligament tears, and external skeletal fixation. Dr. Bleyaert enjoys horseback riding, hunting small sea creatures at the beach with her children and woodworking in her garage. Dr. Alyson Bradshaw is a small animal medicine and surgery intern. Dr. Bradshaw enjoys sunshine and the water. She also likes to travel, hike and read. She has a cat named Clover. Dr. Nicholas Buscaglia is a small animal medicine and surgery intern. Dr. Buscaglia enjoys playing and refereeing soccer, hiking, fishing and skiing. He is willing to try pretty much any type of food (especially if seafood is involved). 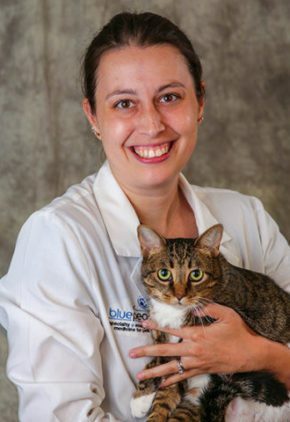 Dr. Lauren Cochran’s research experience includes boxer colitis, pancreatitis, and nutritional management (including effects of esophageal feeding tube placement) in cats with chronic kidney disease. Her primary clinical interests include gastroenterology, renal and lower urinary tract disease and immune-mediated disease. Dr. Cochran enjoys riding horses, as well as traveling, hiking, biking, kayaking and cheering on Georgia and Auburn. Her mixed breed dog is named Tater. 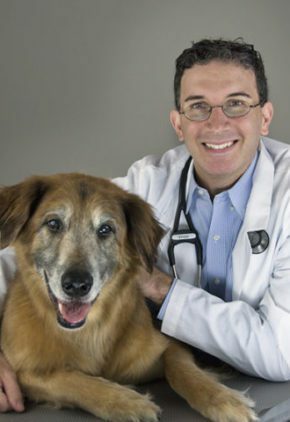 Dr. Coyle manages a large caseload of pets with cancer, with the goal of extending their lives while providing a good quality of life. Dr. Coyle loves her all-orange family: a golden retriever named Murphy and two cats, Aubie and Ellie. She loves college football and is an avid Auburn fan. 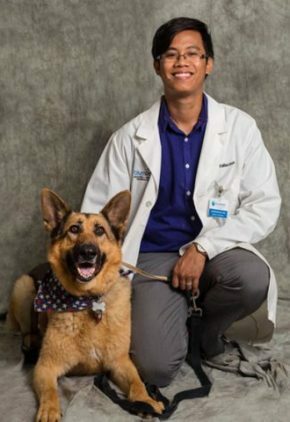 Dr. Devon Diaz is a small animal medicine and surgery intern. Dr. Diaz enjoys traveling with his wife, cheering on the Florida State Seminoles and relaxing days at the beach. He has two golden retriever brothers, Moose and Sammy. 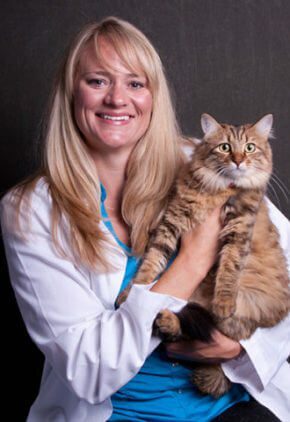 Dr. Trysta Dionne is a small animal medicine and surgery intern. 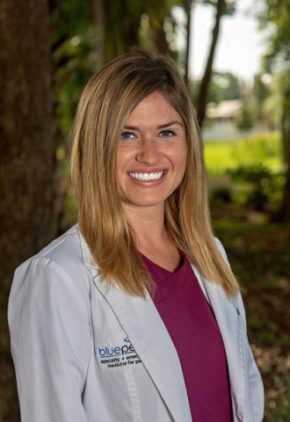 Dr. Dionne’s favorite pastimes include working out, exploring new restaurants and new cities, sleeping, and playing with her dogs, Benson and Elle Jae (aka Ellie). 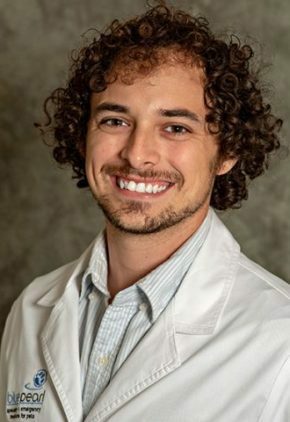 Dr. Evan Ducker is a small animal medicine and surgery intern. Dr. Ducker is a huge soccer fan. He and his wife, also a veterinarian, have two dogs: Nala, a Chesapeake Bay retriever/mountain feist mix, and Sir Isaac, a beagle mix. Dr. Dugger enjoys all aspects of emergency medicine. 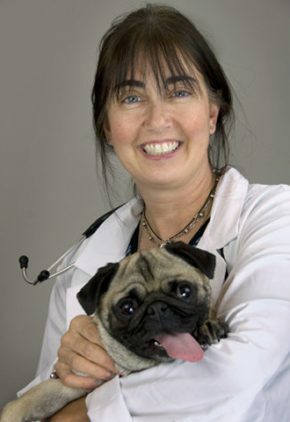 Dr. Dugger’s hobbies include spending time with her pugs, sailing and photography. Dr. Sloane Everett is a resident in our cardiology service. Dr. Everett likes to cook, travel and spend time with friends. Her cat is named McLemore. 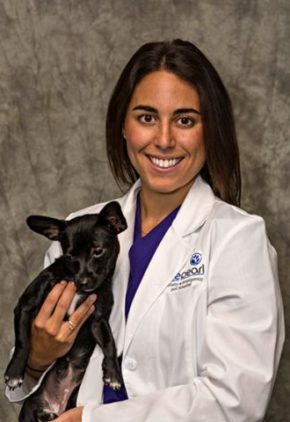 Dr. Lucia Fleischmann is a small animal medicine and surgery intern. Dr. Fleischmann loves to travel, explore nature, watch reality TV and read novels. Her favorite food is cheese, and she can't survive without coffee. Her pets include cats Jezebel and Pinti and golden retriever Sadie. 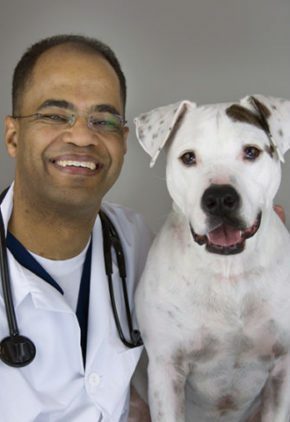 Prior to veterinary medicine, Dr. Merrick Fultz worked in the comparative medicine department at Johns Hopkins University. He is currently a resident in our cardiology service. 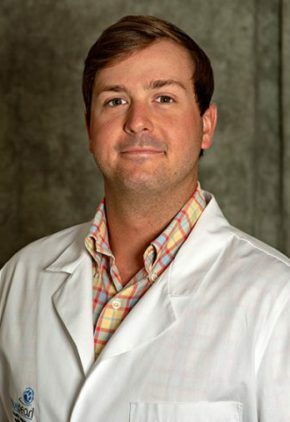 Dr. Merrick enjoys golf, tennis, assorted outdoor activities, any kind of international sporting event and spending time with his friends and his Mississippi shelter dog, Miss Wendy. 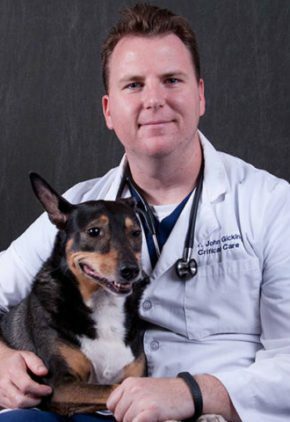 Dr. John Gicking enjoys all aspects of critical care medicine and can often be found training others and presenting continuing education to the veterinary community. 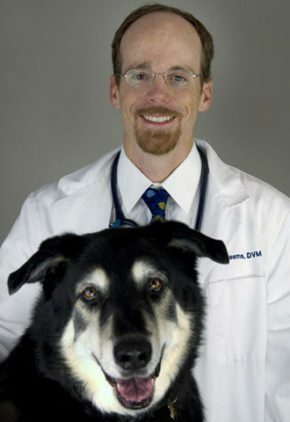 Dr. Gicking enjoys K9 sports, including agility and obedience. He also spends time outdoors, scuba diving, and participating in competitive chili cooking. 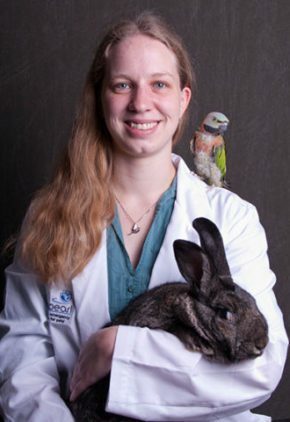 Dr. Kristin Gill enjoys all aspects of avian and exotics medicine. Dr. Gill's favorite pastimes include knitting, reading, kayaking and bird training. Her pets include Juno, a mixed-breed rabbit; Pia, a moustached parakeet; Mai, a corn snake; and Cooper, a gargoyle gecko. 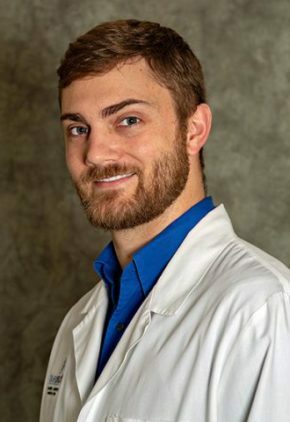 Dr. Nat Goolik enjoys all aspects of emergency medicine and has a particular interest in diagnostic imaging. An avid runner and sports fan, Dr. Goolik faithfully cheers on the Hoosiers. She loves cooking but admits that when she cooks, she tends to use every dish in the kitchen. She has an Australian shepherd named Brody. Dr. Wendy Gwin enjoys all aspects of diagnostic imaging. 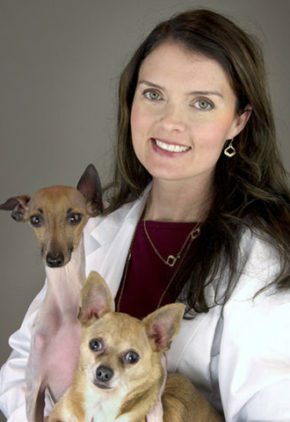 Dr. Gwin’s family includes four dogs named Pup, Dino, Siman and Jake. Her interests include exercising, music and art. 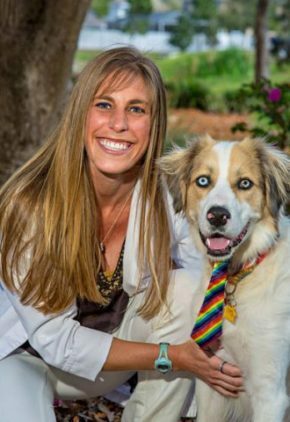 Dr. Chelsea Gyure enjoys the variety of cases, challenges, and fast-paced, organized chaos that is emergency veterinary medicine. She finds neurologic and toxicity cases to be particularly gratifying. Dr. Gyure enjoys all types of outdoor exercise, traveling, singing in the shower, coloring, Netflix, cleaning, shopping and all things Disney. Her Dutch mix rabbit Beatrix is named after Beatrix Potter. 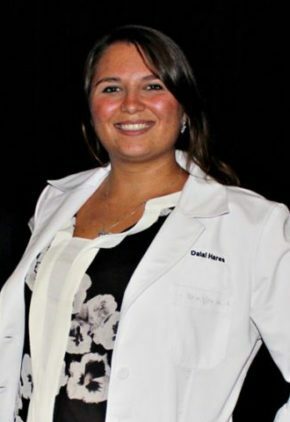 Dr. Dalal Hares' clinical interests include surgical emergencies, thoracic surgeries, trauma and critical care. A fan of outdoor activities like kayaking, horseback riding and scuba diving, Dr. Hares admits that her favorite pastime is traveling to new places around the world. She has a Manx cat named Cleopatra. Dr. Bradley Harris is a resident in our critical care service. An outdoorsmen, Dr. Harris can often be found running, camping and fishing. He also enjoys watching Cardinals baseball and spending time with his wife and daughter. 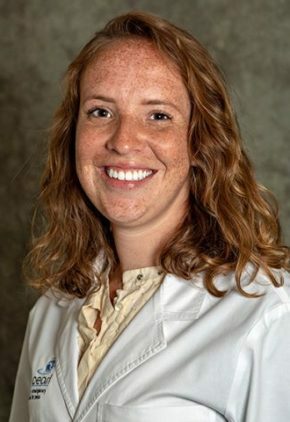 Dr. Kyra Hartog is asmall animal medicine and surgery intern. Dr. Hartog enjoys cycling, hiking and water-sports. Music is another favorite pastime, both playing guitar and attending festivals. Jesse is Dr. Hartog’s golden retriever. 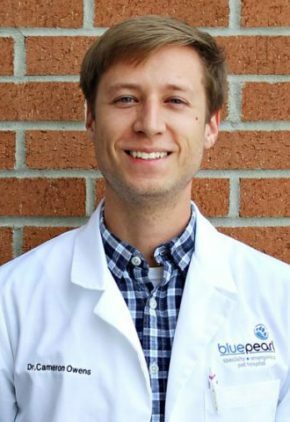 Dr. Peter Helmer came to BluePearl with almost 20 years of experience in both small animal and avian and exotics medicine. He lectures at national conferences on topics such as avian orthopedics, radiology and physical exam. 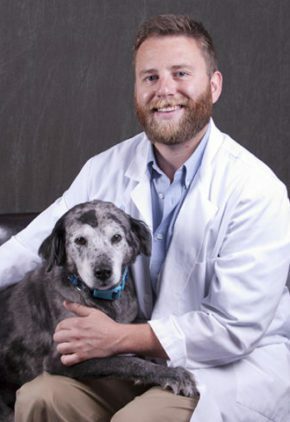 His special interests include senior pet care, especially long-lived birds, orthopedics, surgery and treatment of rabbit and rodent dental disease. 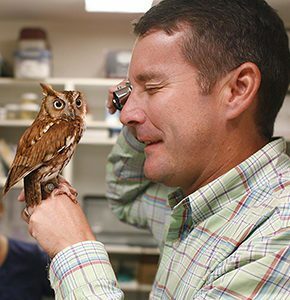 Dr. Helmer treats birds of all types, including backyard poultry; non-venomous reptiles; amphibians; and small non-domestic mammals such as rabbits, ferrets, guinea pigs, sugar gliders, hamsters and rats. Dr. Helmer’s home is filled with the kind of a menagerie of animals you might expect from an avian specialist: there is golden retriever Davis, Shih Tzu Fergie, and cat Boots, plus a Derbyan parakeet named Big Bird and a yellow-naped Amazon parrot, Sonny, who is almost as old as Dr. Helmer is. His favorite pastimes include kayaking, fishing, growing orchids, cooking and enjoying fine wine. 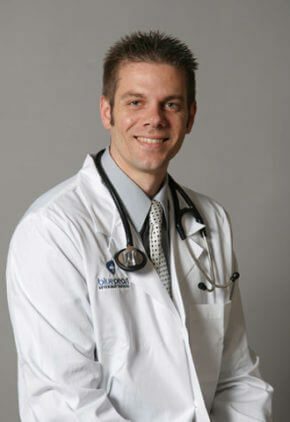 Dr. David Hoch's special interests include transfusion medicine; metabolic disorders like diabetic ketoacidosis, pancreatitis, disseminated intravascular coagulation and systemic inflammatory response syndrome DIC/SIRS; and surgery involving foreign bodies, splenectomies, gastric dilatation volvulus GDV, and C-sections. Dr. Hoch and his family share their house with a variety of pets: dachshund Paxton, Chihuahua Lola, a Pacman frog, two pythons and three African cichlid fish tanks. An avid golfer, Dr. Hoch hopes to one day finish 18 holes using only one golf ball. 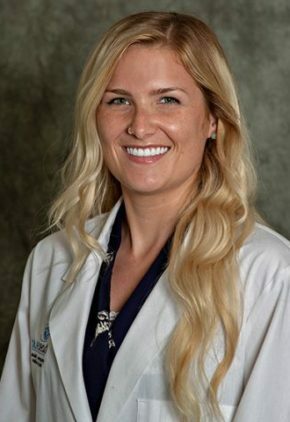 Dr. Kelsey Human is a resident in our surgery service. Dr. Human enjoys activities with her husband, especially training at the gym, hiking, rock climbing, rollerblading, watching documentaries and cooking. Fascinated by small ruminants and camelids, she hopes to have a hobby farm one day to raise them. The family has two Bengal cats, Bonsai and Koi. Dr. Anthony Ishak enjoys all aspects of cardiology and internal medicine. Dr. Ishak’s family includes two dogs named Stanley and Pumba, and two cats named Ramses and Siptah. 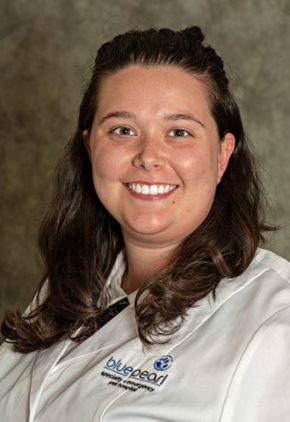 Case variety is what drew Dr. Meghan Johnson to emergency medicine, and within the field, she especially enjoys treating toxicities, hepatopathies and neurologic cases. She also likes working with exotics and wildlife. Dr. Johnson enjoys spending time outdoors with her husband and her two mutts. Her favorite pastimes include kayaking and scouring the city looking for quality caffeinated beverages and curry. 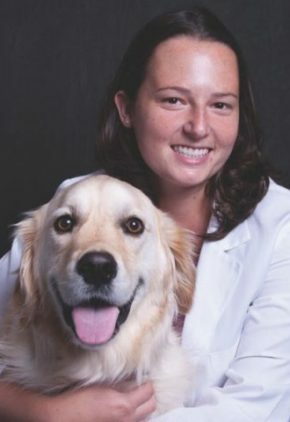 Dr. Martha Julien is a small animal medicine and surgery intern. Having grown up on a farm in Nebraska showing quarter horses competitively, Dr. Julien still enjoys riding. Other favorite pastimes include running, hiking and traveling. Dr. Curtis Kane enjoys all aspects of oncology. 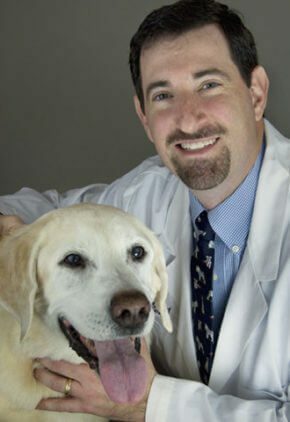 Dr. Kane enjoys spending time with his family, which includes four dogs. He is also a soccer fanatic. Dr. Kelly Kezer’s clinical interests include lymphoma, osteosarcoma and histiocytic sarcoma, and she is excited about new treatment options, to include targeted and combination therapy and immunotherapy. 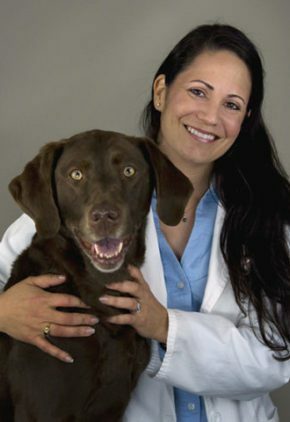 Dr. Kezer enjoys traveling, cooking and hiking with her dogs – a golden retriever named Charlie and Eddie, a Labrador. 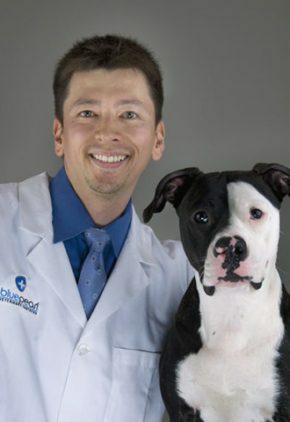 After veterinary school, Dr. Michael Kimura worked in his native Japan as a family veterinarian for two years. He enjoys all aspects of neurology. Dr. Kimura enjoys fresh water fly-fishing, hiking, camping, tennis and cooking Japanese cuisine. 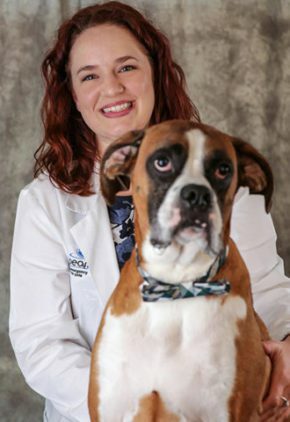 Dr. Ashley Lackey is a small animal medicine and surgery intern. Dr. Lackey enjoys being outdoors going to the beach, fishing, hiking and running. She also likes to travel and is always looking for a new adventure. Dr. Kristen LaCroix is a small animal medicine and surgery intern. Dr. LaCroix has visited every continent except Antarctica. She loves working with wildlife and has been fortunate to be able to do so during some of her travels. Loki is her cat from St. Kitts. 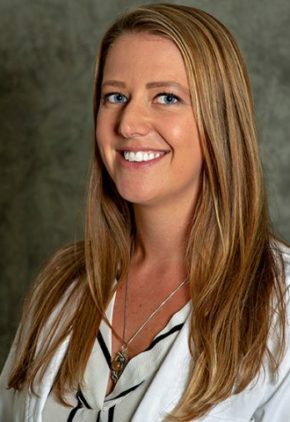 Dr. Melinda Larson is especially interested in endocrine diseases, as well as abdominal ultrasonography and endoscopic procedures such as gastroduodenoscopy, cystoscopy and rhinoscopy. 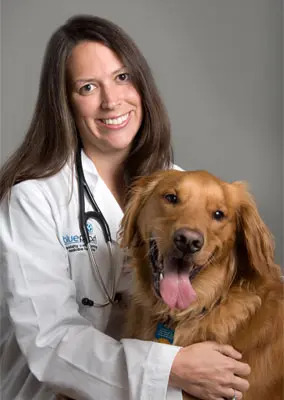 Dr. Larson enjoys running, reading or spending time with her Labrador retriever and two cats. She also enjoys traveling to Arkansas to visit her family. 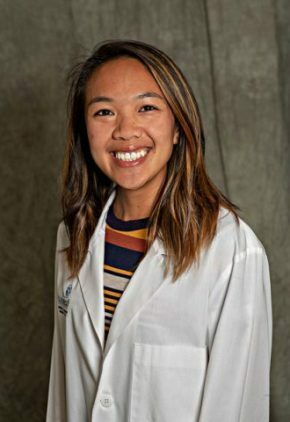 Dr. Sylvia Lee sees surgeons as “fixers,” and the types of surgical cases she especially likes to “fix” include advanced orthopedics, oncology and regenerative medicine for chronic osteoarthritis. She also finds minimally invasive surgery gratifying. Dr. Lee's favorite pastimes include trail running and cooking (but not baking). She has two animal companions, boxer mix Bailey and cat Slinky. 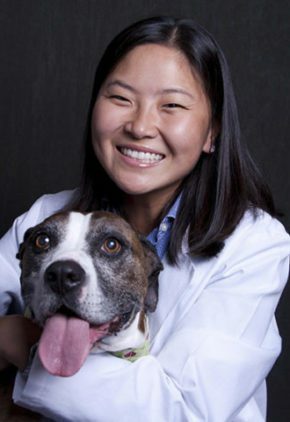 Dr. Katie Lee is a small animal medicine and surgery intern. Dr. Lee has been an Irish dancer since she was 4 years old, and in addition to dance, she enjoys knitting, kayaking, taking care of her freshwater fish tank and cheering on the Michigan State football team. Her pets include Dyna, a great Dane mix and Diego, an Oriental fire-bellied toad. Dr. Andy Leung likes trauma cases and wound care. He also finds diabetic ketoacidosis cases rewarding. Dr. Leung’s favorite pastimes include traveling, recreational sports, and playing music and attending concerts. 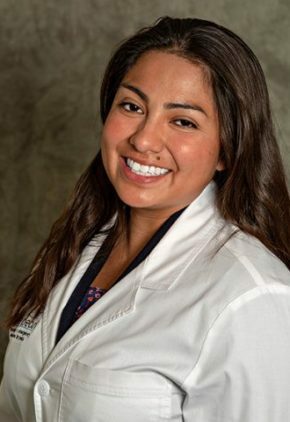 Dr. Kathy Martinez Rodriguez is a small animal medicine and surgery intern. 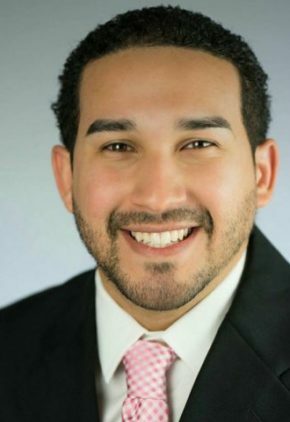 Born and raised in Puerto Rico, Dr. Martin Rodriguez is fluent in both Spanish and English. She enjoys the beach, yoga and sipping tea or wine. She adopted a cat in Grenada named Zeus. 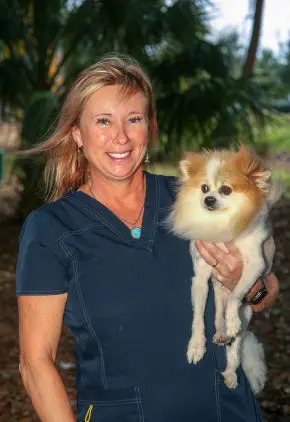 Dr. Mears has been with BluePearl, and its predecessor, Florida Veterinary Specialists, since 1997. 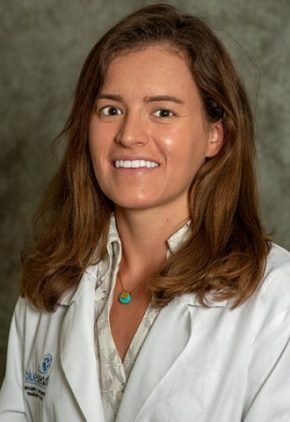 Before joining BluePearl, Dr. Miller Michau was assistant professor of ophthalmology at North Carolina State University, where she was awarded the Bayer Faculty Teaching Award. 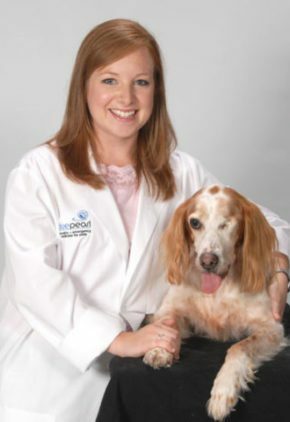 She currently is on the Board of the International Equine Ophthalmology Consortium. 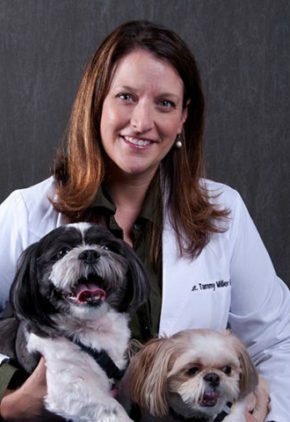 Dr. Miller enjoys spending time with her shih tzus and competes in dressage with her Dutch warmblood horse, Wodan. 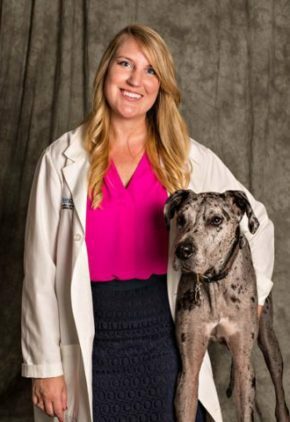 Dr. Megan Minchin's particular clinical interests include feline urethral obstructions, renal failure, trauma and shock. A diehard sports fan, Dr. Minchin’s favorite teams are the New York Mets and Tampa Bay Lightning. She loves biking and hiking and enjoys playing cards, reading biographies and watching World War II movies. Caleb is her Siamese cat mix. Dr. Thao Nguyen is part of our emergency medicine training program for clinicians. Dr. Nguyen enjoys outdoor activities, traveling, baking and cheering on the Florida Gators. She is a proud dog mom of Cakeiyo, a Maltese, and Rua, the “golden Irish” she brought back from vet school in Ireland. Dr. Corinna Palko particularly enjoys surgery and critical care. 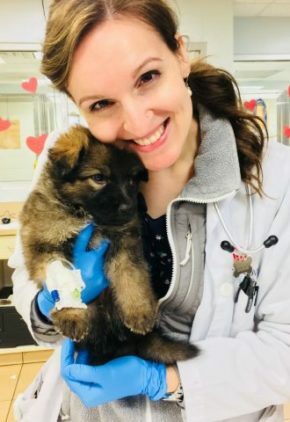 Dr. Palko likes playing basketball, working out and spending time with her two dogs, Pixie and Sven, who she adopted while in vet school in St. Kitts and Nevis. 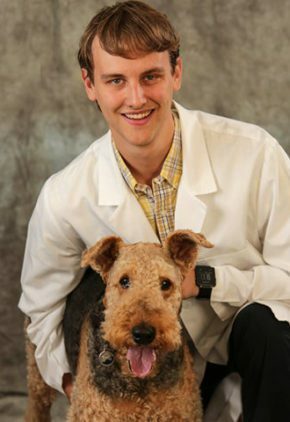 Dr. Michael Pawenski is a small animal medicine and surgery intern. Dr. Pawenski enjoys the ocean and most things related to it, including scuba diving, boating and documentaries. He even considers himself an amateur shark biologist. He also likes napping and spending time with his dog Astro. Dr. Tessa Phillips is a resident in our surgery service. 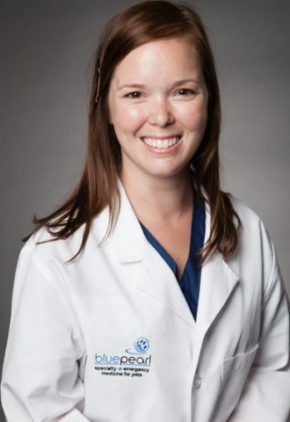 Her particular clinical interests include all soft tissue procedures, minimally invasive techniques (arthroscopy/laparoscopy) and wound and skin reconstruction. Dr. Phillips' hobbies include cycling, hiking, traveling, motorcycles and playing guitar. 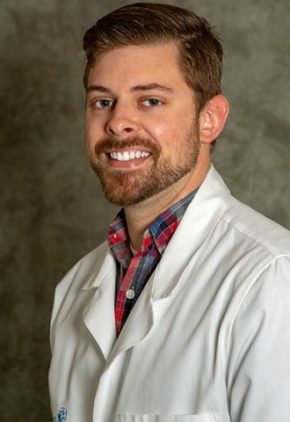 Dr. Taylor Poppell is a small animal medicine and surgery intern. An avid outdoorsman, Dr. Poppell enjoys hunting, fishing and spending time on the water. Dr. Mallika Prabhakar is an intern in our internal medicine service. Dr. Prabhakar is an avid tennis player and fan. She is trained in voice and piano and is learning to play the guitar. To unwind, she cooks and bakes. Cookie is her Rhodesian ridgeback/yellow lab mix. 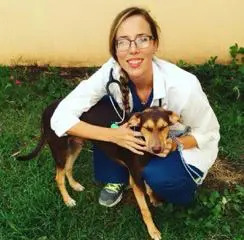 Dr. Alejandra Príncipe Martínez is a small animal medicine and surgery intern. Dr. Príncipe Martínez considers the water her happy place, enjoying the beach, scuba diving and snorkeling. She also likes to hike and play video games. Carmelo is her island cat from Grenada. 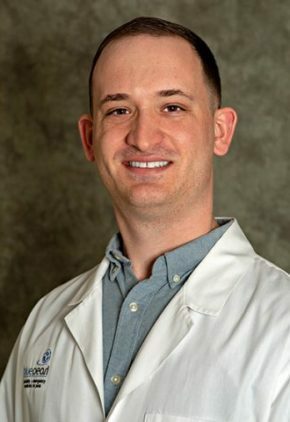 Dr. Michael Reems has particular interest in both surgical oncology, including cancer removal and reconstruction, and minimally invasive surgery arthroscopy, laparoscopy, and thoracoscopy. He has performed urinary bladder stone, lung lobe tumor, adrenal gland/mass, cryptorchid retained testicle, and gall bladder removals minimally invasively, in addition to prophylactic gastropexy fixation of stomach for prevention of gastric-dilatation volvulus and laparoscopic liver biopsy. 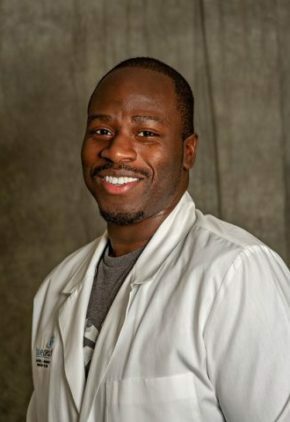 He has also completed specialized training in circular external skeletal fixation fracture repair, and tibial tuberosity advancement TTA and tibial plateau leveling osteotomy TPLO procedures for anterior cruciate ligament tears. 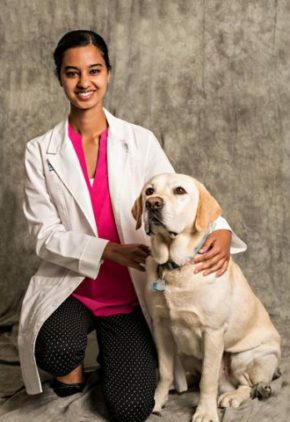 Dr. Reems volunteers examinations and surgical treatments for service dogs. He enjoys spending time with his wife, a criticalist at BluePearl, cat Fat Bobby, and dogs, Emma and Maggie. His favorite pastimes include saltwater fishing, mountain biking, and fly fishing. Dr. Miryam Seems enjoys all aspects of emergency and critical care. 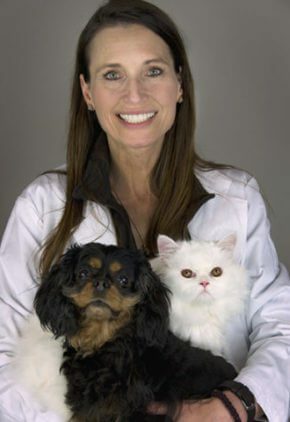 Dr. Reems’ family includes cats named Fat Bobby and Sagan as well as a dog named Emma. 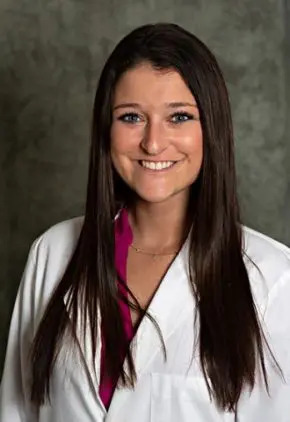 Dr. Jennifer Ringenberg is a small animal medicine and surgery intern. Dr. Ringenberg donates her time to the conservation of marine mammals and sea turtles. She also enjoys bowling, going to concerts and spending time outdoors. Diesel is her mixed breed dog, Luna her cat, and Daenerys her bearded dragon. 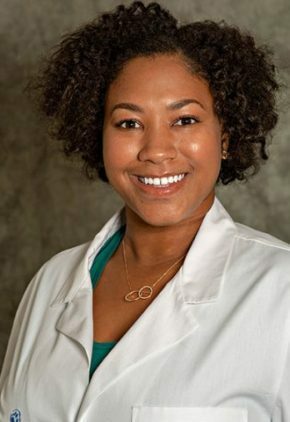 Dr. Tierra Rose is a small animal medicine and surgery intern. Dr. Rose likes outdoor activities, such as hiking, amusement parks and anything involving a beach. She is also a Netflix enthusiast and likes to pretend that she’s a top chef and food critic. 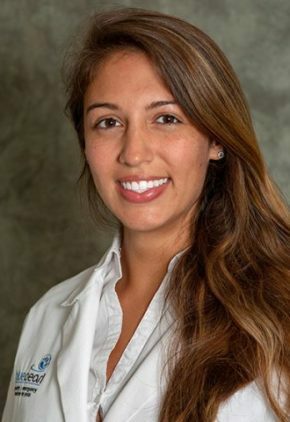 Dr. Elise Sanchez is a small animal medicine and surgery intern. Dr. Sanchez loves the beach and sushi. She also enjoys hiking and painting. Her three cats are Logan James Catlet (James), Anna Marie Roogue (Roux) and, Boux Jean Grey (Boux). 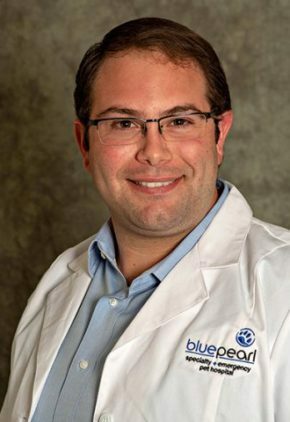 Before coming to BluePearl, Dr. Alan Spier was an assistant professor at the University of Missouri in Columbia. He enjoys all aspects of cardiology. An avid — and vocal — Green Bay Packer fan, Dr. Spier enjoys spending time with his wife and three children. Dr. Steven Tutela enjoys all aspects of emergency medicine. 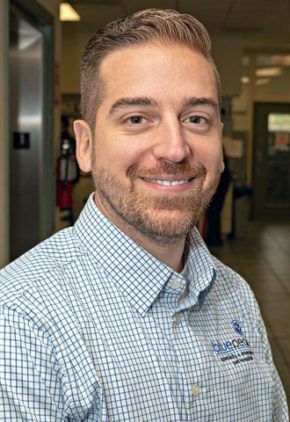 Dr. Tutela enjoys lifting weights and the endless outdoor activities found in Florida, although he admits to missing family and friends back in New Jersey. 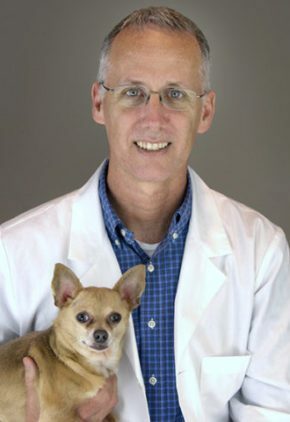 Dr. Eric van Eerde’s particular interests include hand-on modalities such as ultrasound, as well as building relationships with referring veterinarians through telemedicine. He also enjoys working with a variety of animals and feels fortunate to have been able to take images of a number of species at the local zoo during his residency. Dr. van Eerde enjoys travel, woodworking and Florida Gator sports. He and his wife have two sons, and a number of pets: miniature schnauzer Daisy, Florida brown dog Demodexter, Havanese Boo, and a green-cheeked conure bird named Kiwi. Dr. Jessica Weeks' special interests include ocular disease, dystocia, diabetic ketoacidosis, and gastrointestinal foreign bodies. 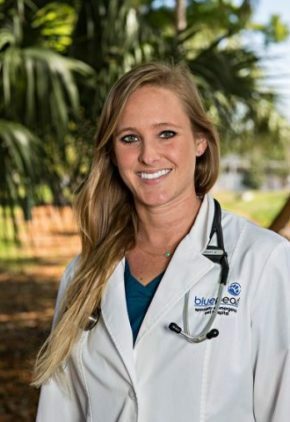 Before vet school, she worked as a dolphin trainer at the Dolphin Research Center in Marathon FL. A former NCAA division I All-American swimmer, Dr. Weeks enjoys any activity associated with water: scuba diving, spearfishing, surfing and underwater hockey. Dr. Weeks is also a concert pianist. She has a cat named Tamale. Dr. Clarence Williams is part of our emergency medicine training program for clinicians. 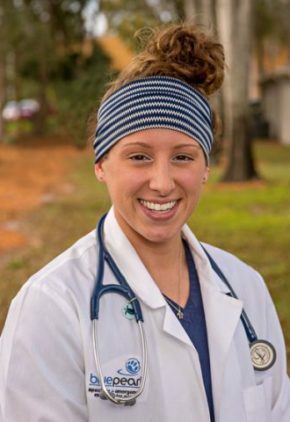 Dr. Zoe Williams is a small animal medicine and surgery intern. Dr. Williams likes cheering on the Tennessee Volunteers, shopping, traveling and spending time hiking with her dog Bonnie, a mixed breed shelter dog who likes to carry her toys around. 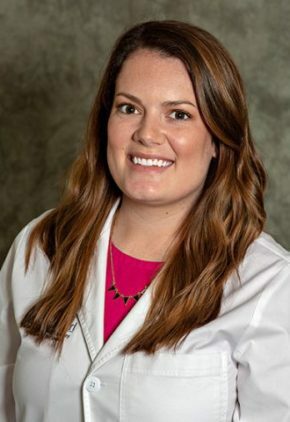 Dr. Whitney Wyatt is an intern in our oncology service. Dr. Wyatt is an avid Florida State football fan. She enjoys going to the beach and pool, kayaking, traveling and spending time outdoors with her dogs, Tiger Lily and Bella Blue. She also has two cats, Captain and Rumpel. 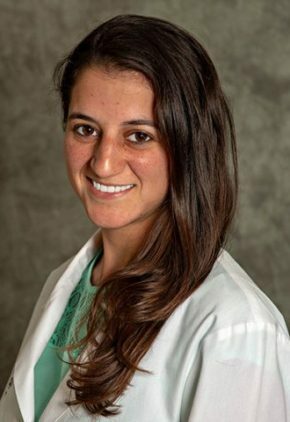 Dr. Jessica Yousif enjoys all aspects of emergency medicine. Dr. Yousif’s favorite pastimes include photography, soccer, weight lifting and creative writing. She is also an avid Chicago sports fan. Her pets include greyhound Shandy and cat Roti. 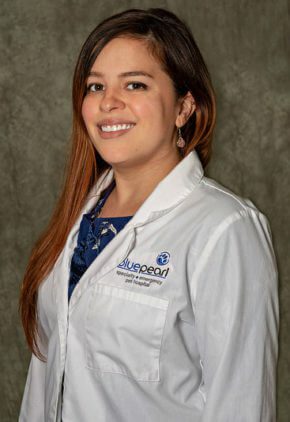 Dr. Nadine Znajda enjoys all aspects of dermatology. 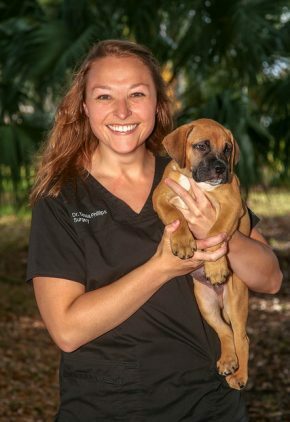 In addition to spending time with friends and family, like so many of us in the veterinary world, Dr. Znajda enjoys her many pets. Melissa cites the wide range – and often unexpected nature – of cases in emergency and critical care as the best part of her work. “I find it extremely exciting, not knowing what is going to walk through the door,” she says. Karen enjoys interventional procedures to correct defects that cause congenital heart diseases. 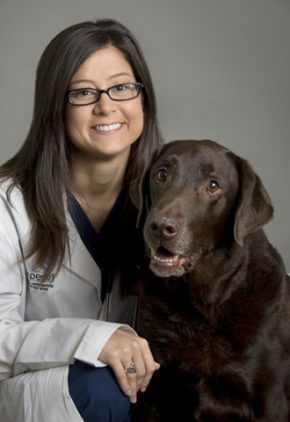 She also enjoys helping patients with acquired heart disease live longer and more comfortably. Her family includes a pug, Chihuahua and four cats, and she loves traveling and watching her son play baseball.